"Living here is like you're on vacation, there is a beautiful clubhouse, gym, swimming pool, tennis court, and a little play area for children. 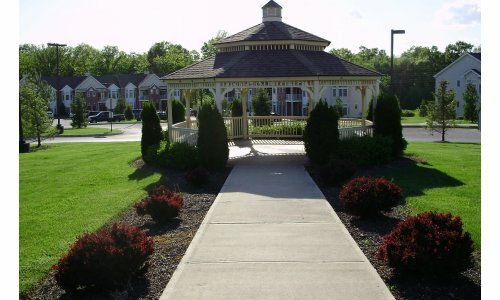 There is even a gazebo to sit in on a warm night." "We visited every property in the area, as soon as we drove into The Regency Club we realized that this is where we wanted to live. The entire property is impeccable. The landscaping and maintenance is second to none. The complex itself is expertly maintained, any issues and one call to Evelyn and a quick visit from Ron and your problem is solved. The quality of tenants is equal to the beauty of the complex. For commuters like us, the location is ideal, there are many public transportation options to NYC. We couldn't ask for a better place to live and raise our son." "We were looking for a peaceful quiet environment and we definitely found it at the Regency Club. We absolutely love, love, love our spacious apartment. The beautiful bay window brings in lots of natural light into our living room and the extra bedroom (which we use as a guest room) is a quiet space to read a book or sit back and relax and listen to music. We also like to take advantage of the gym...and the pool is a great place to unwind on your day off...and the staff here are very friendly and helpful...we love it here!" "A great place for retired people, no hassles with home repairs and ownership." "I would heartily recommend our community to anyone looking for a place to live."